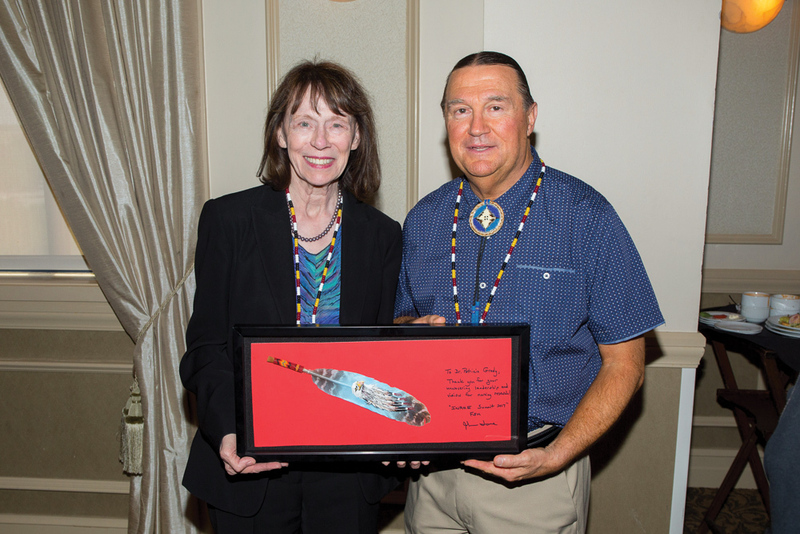 John Lowe '81, of Tallahassee, Florida, is executive director of the first indigenous nursing research center in the world, dedicated in May 2017 at the Florida State University College of Nursing. Lowe, a Cherokee, is McKenzie Endowed Professor for Health Disparities Research at FSU. He will give a Suter Science Seminar Feb. 13 and speak to several classes at Eastern Mennonite University. John Lowe ’81, endowed professor for health disparities research and director of the Center for Indigenous Nursing Research for Health Equity at Florida State University College of Nursing, will give two public presentations at Eastern Mennonite University. He will speak during campus worship time at Lehman Auditorium at 10:10 a.m. on Wednesday, Feb. 13, and will also present a Suter Science Seminar at 4 p.m.
Lowe will provide an overview of biological, psychological, social, and cultural health disparities among Native American and Indigenous populations globally impacted by colonization. He will also discuss innovative intervention research approaches that he and his research team are using to address these health disparities. He earned his bachelor’s degree in nursing from EMU, his master’s degree from Oral Roberts University, and his doctorate in nursing research from the University of Miami. His post-doctoral work included mental health/substance abuse research at Florida International University. Lowe, who is Cherokee, Creek and Lenape, and an enrolled Eastern Cherokee tribal member, was the first Native American man to be inducted as a fellow in the American Academy of Nursing. He has represented the nursing profession in many national and international forums, and with national leaders in the U.S. He has provided health-care services and research consultation to underserved/disadvantaged populations around the globe. Models that have emerged from his funded research are being used to promote the health and well-being of Native Americans and Indigenous peoples. This is the second of five spring semester Suter Science Seminars, which are made possible by the sponsorship of the Daniel B. Suter Endowment in Biology and the co-sponsorship of supporting programs. The next seminar is on Feb. 27, and features Windsor Westbrook Sherrill, professor of public health sciences and associate vice president for Health Research at Clemson University, on Healing with Words: The Bibliotherapy Program at Clemson University. Will Professor John Lowe’s seminar be available in any form? His topic would be relevant for the Indigenous tribes here in Maine.